We've taken another look at campaign contribution data — who contributes to whom? 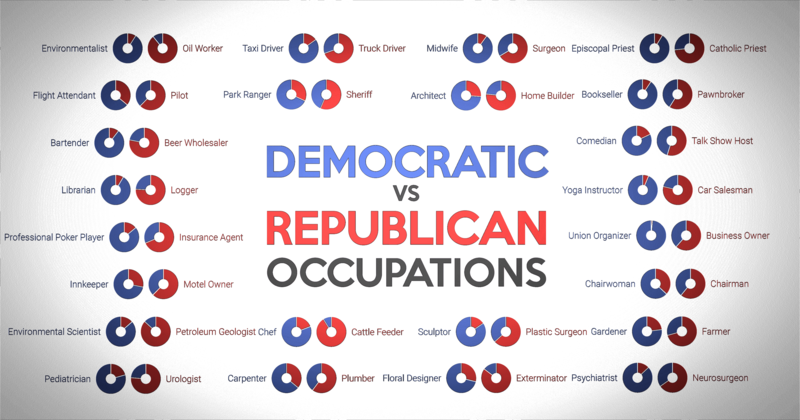 What patterns emerge when you look at Democrats vs. Republicans or candidates vs. each other? 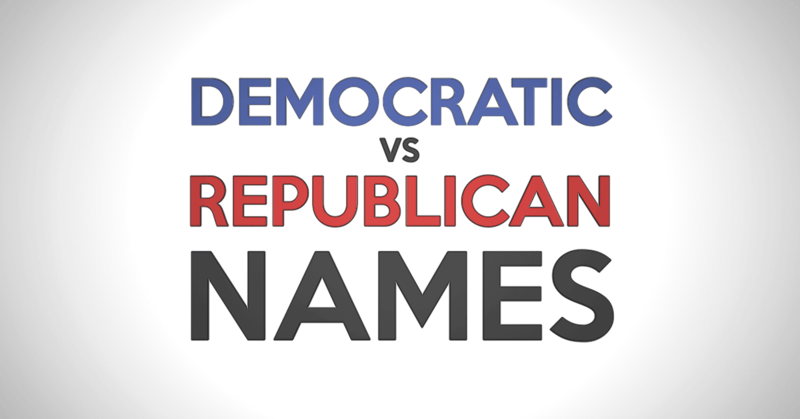 For example, people named Chad tend to be Republicans, while Jonathans tend to be Democrats. Interesting stuff. Check it out over at apprecs.com. 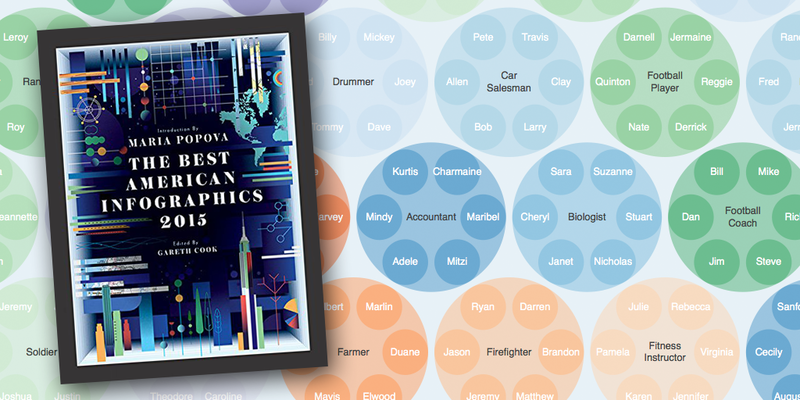 Now in Best American Infographics 2015! Earlier this year, we received a message from Gareth Cook, Pulitzer Prize-winning journalist and editor of the Best American Infographics book series. Apparently, one of our data visualizations had been selected "with help from a group of 25 top designers, including Nigel Holmes, John Grimwade, Fernanda Viegas, Martin Wattenberg, and Nathan Yau" to be featured in this year's edition. 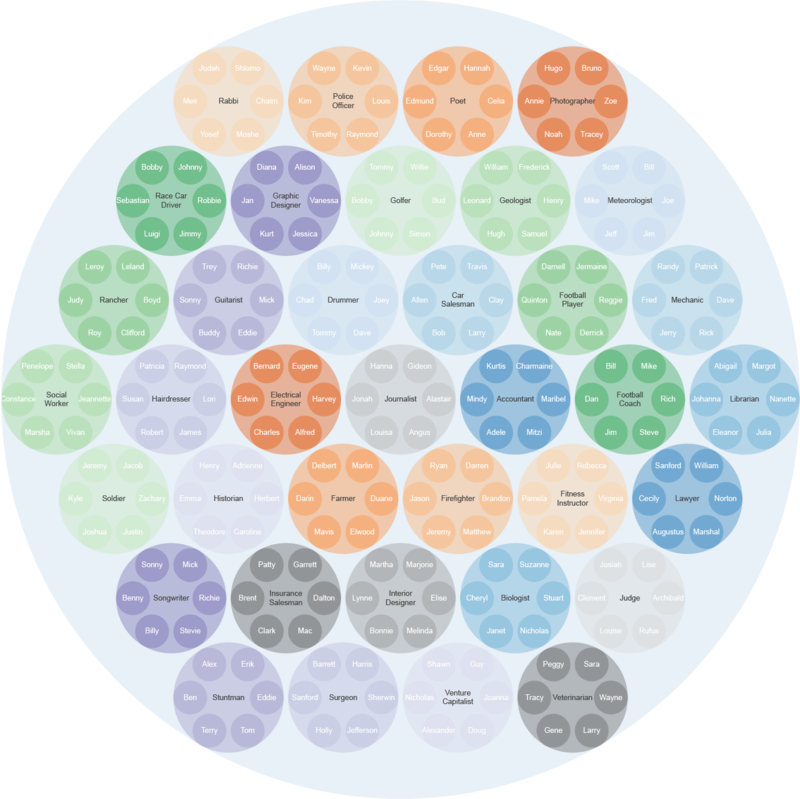 Our Top Disproportionately Common Names by Profession infographic is on pages 18-19. Very cool! The book was just released today -- we're really looking forward to receiving our copy. Are you an architect? It's likely that you're a Democrat. Pilot? Probably Republican. What about journalist? Fisherman? Bartender? We've just posted a new chart that sheds light on this, the political bent of various professions. 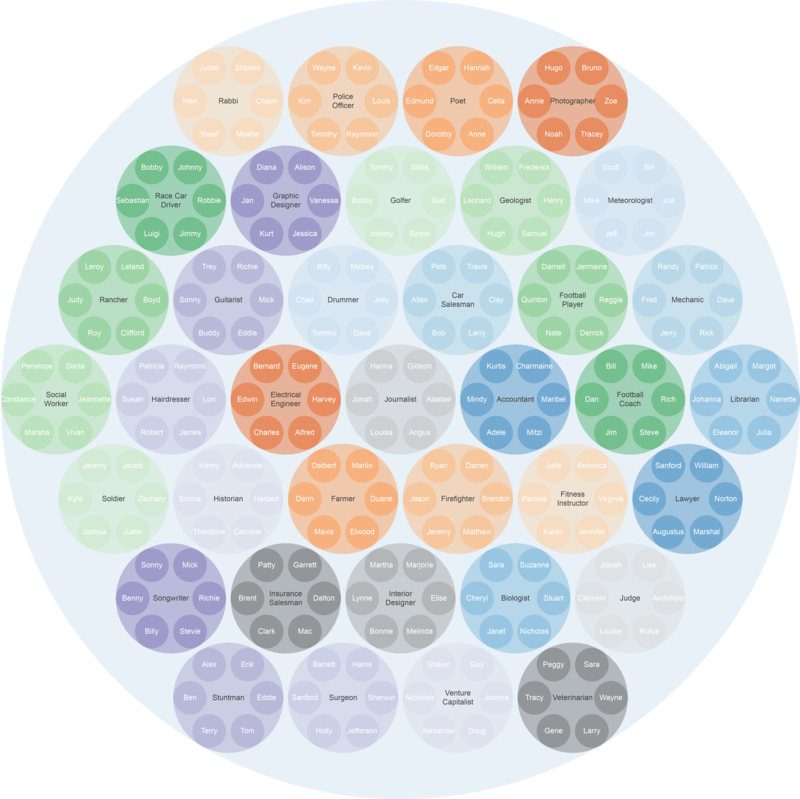 It's the third in a trio of visualizations sprouting from the data analysis we've been doing for the Nametrix baby names app. The results are especially interesting when you juxtapose professions that are aligned or opposed in some way. Not surprisingly, environmentalists and oil workers are at opposite ends of the spectrum. Why, though, are pediatricians overwhelmingly Democratic while urologists are overwhelmingly Republican? 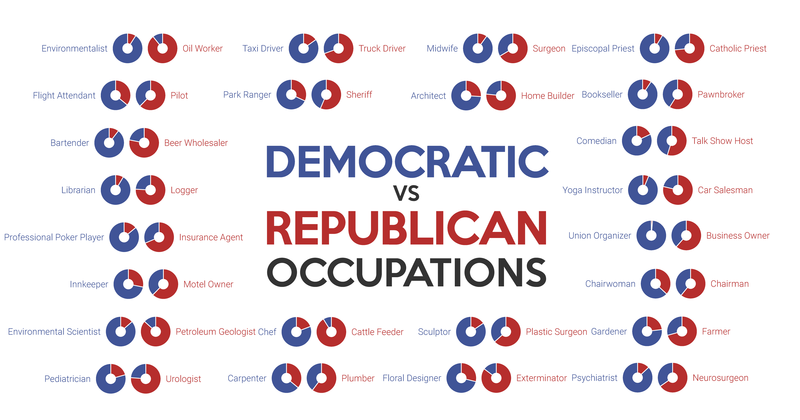 A caveat with this methodology is that we assume Democrats and Republicans contribute at a similar rate to each other within each profession. In other words, we assume that a 75 / 25 split of contributions by Democratic teachers vs. Republican teachers translates to a 75 / 25 split of Democrat vs. Republican teachers in the general populace. If it's actually the case that, say, Republican teachers are looser with their wallets and have a higher per capita contribution rate, our ratio for that profession will be a bit skewed. Thus, the ratios should be viewed as approximate. Until now, the answer to "Where can I get the Android version of Nametrix?" question has usually been "it's a few months away -- we're just getting started on it!" Yes, it's been a long time coming -- we launched Nametrix for iOS way back in 2012. The Android version of the best baby name research app in our galaxy has some features that aren't yet in the iOS version. Most notably, there's a "Browse" tab within which you can explore lists of names by theme (nature, colors, mythology, etc. ), popularity, or other criteria. The new, tab-based navigation is more intuitive, and there's the super useful ability to jump back to names you've recently looked at. Hannah, Emma, Joanna - Poet, Historian, or Venture Capitalist? In response to the title, Hannahs are particularly apt to be Poets, Emmas Historians, and Joannas Venture Capitalists. Next question: What do August, Hannah, and Jules have in common? It turns out that people with those names are more likely than others to be playwrights. How about Casey, Vincent, and Roy? Plumbers. This name & profession correlation is another interesting phenomenon we encountered while building the name metrics for the Nametrix baby names app. For any given profession, it turns out that there are certain names that appear more often in that profession than in the general population. 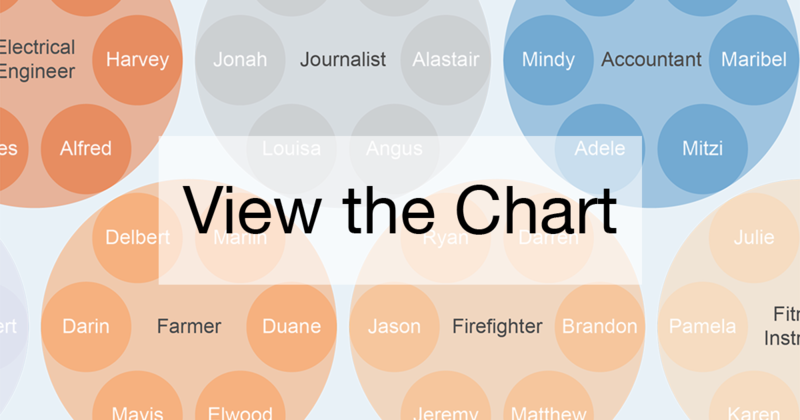 Here's a chart with 6 of the names that are the most disproportionately common in 37 professions. 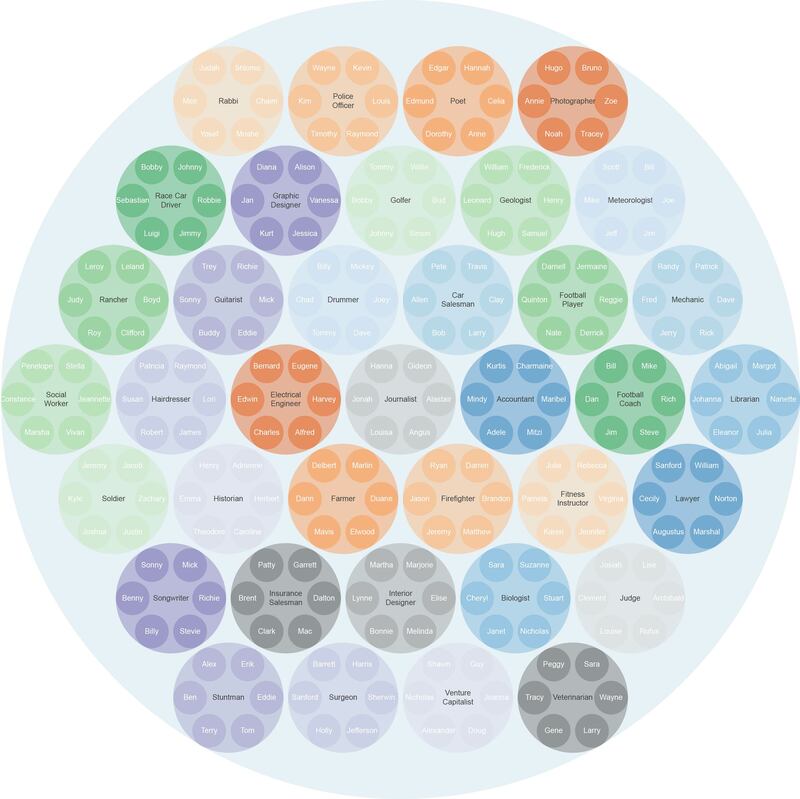 While developing the Nametrix app, we analyzed public records to find the most inordinately common names in each profession. Take Elvis, for example. There aren’t all that many Elvises out there, but a particularly high percentage of them are musicians. As a result, Elvis ranks high among musician names. Elvis isn’t the most common name among musicians — that’s likely to be John or some other very popular name. What’s interesting is that it’s way more common among musicians than you might expect, given how rare it is. In other words, it’s common in that profession relative to its overall frequency. Fortunately, the math behind this isn’t too complicated. Here’s another example, this time with some numbers. In our sample of two and a half million people, a whopping 1.9% of Arnolds are accountants. Contrast that with just 0.55% of Shanes. Arnolds therefore appear to have a much higher tendency to be accountants than Shanes. So, do our names influence where we go in life? Or do the social, geographic, economic, and other factors that might have influenced how our parents named us also direct our career paths?